Egon Albrecht was born on 19 May 1918 at Curitiba in Brazil. In 1940, Albrecht was serving with 6./ZG 1 operating Bf 110 Zerstörer twin-engine fighters. On 26 June, 6./ZG 1 was redesignated 9./ZG 76. In turn, 9./ZG 76 was redesignated 6./SKG 210 on 24 April 1941. With 6./SKG 210, Albrecht flew combat over Russia. On 4 January 1942, 6./SKG 210 was redesignated 6./ZG 1. Albrecht was appointed Staffelkapitän of 1./ZG 1 on 12 June 1942. Oberleutnant Albrecht was awarded the Ritterkreuz on 25 May 1943 for 15 aerial victories plus 11 aircraft, 162 motor vehicles, 254 covered vehicles, 3 locomotives, 8 Flak positions, 12 anti-tank gun positions and 8 infantry positions destroyed on the ground. 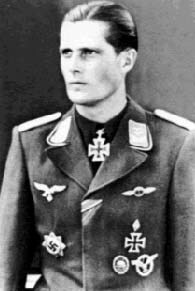 On 9 October 1943, Hauptmann Albrecht succeeded Hauptmann Karl-Heinrich Matern (12 victories, RK, killed in action 8 October 1943) as Gruppenkommandeur of II./ZG 1. In October 1943, II./ZG 1 was relocated to the Western front based on the Atlantic coast of France flying missions over the Bay of Biscay. In October 1943, the Gruppe was transferred to Wels in Austria to combat the incursions from the south of the Italian-based USAAF 15th Air Force. In July 1944, II./ZG 1 returned to Germany for conversion on to the Bf 109 single-engined fighter and redesignation as III./JG 76. Albrecht then led the Gruppe to the Invasion front. On 25 August 1944, Albrecht was forced to break-off a mission because of engine problems. Returning to his base he was intercepted by USAAF P-51 fighters. In the subsequent action, Albrecht was shot down in Bf 109 G-14 (W.Nr. 460 593) “Black 21” over St Claude near Creil. Albrecht managed to bale out of his stricken aircraft but was dead when found on the ground. Egon Albrecht was credited with 25 victories. His total included 15 victories claimed over the Eastern Front and 10 over the Western Front, including at least six four-engine bombers. In addition he recorded 11 aircraft destroyed on the ground on the Eastern Front.